Tulsa Times A Pictorial History: The Early Years Sec 1"
This book is the story of Tulsa told in photos. Many of the photos found in this book are also found in "The Beginning of Tulsa" by J.M. Hall. I don't know if this book is still available through inter-library loan or not but for a family researcher some of the photos may be a valuable addition to their family's history. Below is an complete listing of the photos found in this book. Although a lot of the photos in this book contain people very few of them are named unless they are portraits. The book itself does not contain either a full listing of the photos nor an index. Description of the photos. My comments are between the [ ] Author's captions are in black. "Bird's-eye" views of Tulsa in 1888, above and 1892. The First Methodist Episcopal Church is at right, below. [Top photo has no sign on the building. Several people on the porch. In lower photo the signs on the building reads: (On top of the building) T J Archer Hardwares & Stoves (on the building front) (Left) Furniture & Undertaker D.P. (Right) Wagons Implements Etc]. Thomas Jefferson Archer and his store before it was destroyed. A surrey with fringe on top stands in front of Tate Brady's general merchandise store built in 1890 on Main Street. Brady's motto was "A Dollar's worth of Honest Goods for a Dollar in Money". The Main Street storefront of Brady's Shoe co., built in 1892, is bedecked with boots and work pants. Looking south on Boston Ave 1894. Sam Davis, a well-to-do Indian, right. East side of Main Street between 1st & 2nd Streets. The Frisco meat Market (Tulsa's first). In 1897, fire destroyed half of downtown Tulsa six weeks before the city was incorporated. Jan 18, 1898. The aftermath of the 1897 fire: the gaping cavity was all that was left of the Price-Gillette building and the Tulsa Banking Co. The fire consumed Tulsa's first three masonry buildings and 12 wooden structures. The Rev George Mowbray, who pastored the First Methodist Episcopal Church and preached in the countryside to the Indians, took a course in embalming in 1890 and became the town undertaker on East 2nd Street. Mowbray (2nd from left), also was Tulsa's mayor from 1902 to 1904 and took the city's first census. [Portrait of George Mowbray (right). Photo of a building with a sign: "Undertaker" and one the window "Geo W Mowbray Undertaker" and "Geo W Mowbray, Funeral (2nd word is obscured by a person standing in front of the sign). Horse and buggy in the photo also. The Brady-Martin Red Front Store on Front Street advertised "dry goods, groceries, hats, caps, boots and shoes". 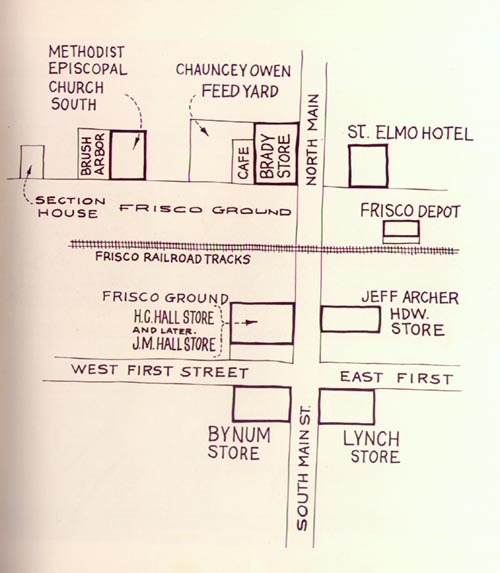 Front Street was the informal name given to the Frisco Railroad right-of-way between Main Street and Boston Avenue. (Upper Photo) Looking north on the west side of Main Street from Second to First streets in 1903. (Lower Photo) Looking north on the east side of Main Street from Second to First Streets in 1903. [Upper Photo: Sign on buildings: "Redmons-Studio, Photographs Enlargements Pictures & Frames", "Dentist" and on the side of one building a partial sign can be seen, "Price (2 words too blurry to read) --nner Party, Flour". In the Lower Photo: "Scott's Cash Store", "Willits Harness Saddles (rest can't be read)"
(Upper Photo) According to Tulsa father J M Hall, the first newspaper was The Indian chief, an irregular publication that began when Tulsa still was a tent city. It evolved into the Indian Republican. A sampling from its columns at the century's turn included: "Ed Egan, our city Marshal, is off his regular post of duty this week on account of being run over at the corner of First and Main streets by Cliff Drew's team of bay horses and buggy. Cliff left town before being arrested." 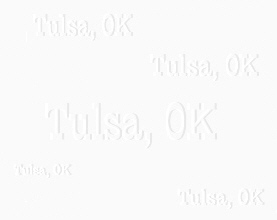 (Lower Photo) The Tulsa World traces its lineage to the first newspaper in Tulsa. The Indian Chief, and The Indian Republican. This is the Tulsa World building, located just west of Main Street on Third Street about 1907. The interior of Reeder's Pharmacy, Second and Main streets. 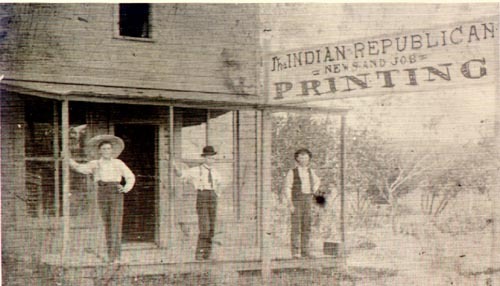 An early druggist and doctor, Charles L Reeder got his store in trade for a claim to his wife's homestead in Comanche county. In 1905, Main Street still had a wild and woolly look, but a sign on the right boasts oysters for sale. Looking south on Main Street from the Frisco Railroad tracks about 1907. The street car was running, but the streets were still dirt. Looking west on First Street from Boston Avenue in 1906. Looking north from the roof of the original Tulsa High School at Fourth Street and Boston Ave in 1906. The Grand Opera House with the arched entry is at center right. A panoramic view of Tulsa in 1909. Second Street and Main are in the center. [Hand written on the photo: "Photo by C Jack, Tulsa copyrighted 1909". This photo spans the two pages with 3 photo sections making up the whole. This photo show autos for the first time. Most of the signs are too small to be read except for "A.Y. Boswell Leading Jewelers" and G R McCullough Has Money To Loan". Street Car is shown in the photo on page 47. 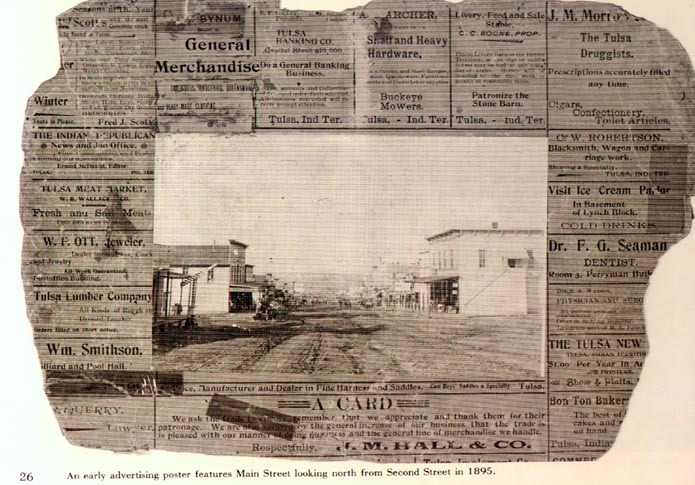 On the lower left of page 47 is a shot of Main Street in 1908 showing the streets were finally paved. This photo has a notation in the lower left "Osage Indian Curio Co" so it appears as if this photo was a post card. 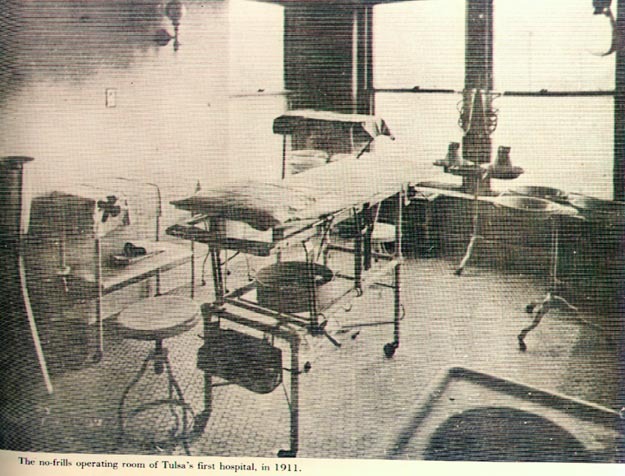 Tulsa's first hospital, Fifth Street and Lawson Ave, was originally built as a 19-room private home but opened as a hospital in 1906 by Dr. Fred S. Clinton. The first patient admitted had smallpox. With would-be patients' comfort in mind, the horse-drawn ambulance in front had rubber tires. Built in 1906, Tulsa's first Fire Station, 211 W. 2nd Street, also served as city hall and police station, complete with a jail in the basement. Fire-Wagon horses were stabled and kept ready to go on the ground floor. The floor was constructed of cedar blocks, but the whole building still frequently smelled like a stable. 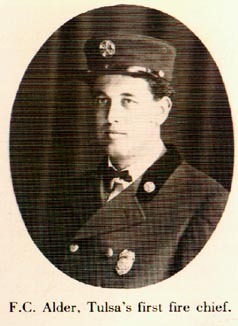 The Tulsa Fire Department in 1910. [Firemen in uniform and equipment are on display in front of the building. Identification is hand lettered on the photo: From left to right: Horse & buggy with one driver, labeled "John"; a early motorized fire truck with a large bell, ladder and fire hose with several men on it, labeled" Webb Pumper"; fire wagon with a two horse team and several men on it, labeled "No 2", Another fire wagon with a two horse team and several men, labeled "No 1"
Portrait of Chauncey Owen on the left. On right: The discovery of oil meant thousands of would-be oilmen who flooded into Tulsa needed a roof over their heads. The construction of hotels, at first primitive, boomed. Chauncey Owen's Tulsa House was one of the city's first inns. Just after the century's turn, The Club Hotel was located on the second floor of Holland's Store on the southeast corner of First Street and Boston Avenue. (Upper photo) The Kallam Livery Stable, 101 E. First St., was remodeled into the Alcorn Hotel by W N Robinson, a Kansan who came to Tulsa in 1902. The hotel had no "sanitary facilities" but boasted one luxury, private brick paving in front. More commonly, loads of corncobs were thrown on the streets as makeshift pavement. (Lower Photo) In 1905 Robinson built a more up-to-date Robinson Hotel on the southwest corner of Third and Main Streets with "sanitary facilities" although initially the sewage ran only into a ravine on North Main near the railroad tracks. W. Tate Brady played dueling hotels with W N Robinson to accommodate the influx of oilmen. The Hotel Brady (left) was built in 1904. When Robinson built his new facility in 1905, Brady responded a few years later with a towering annex (right). Old-timers said more oil deals were struck in hotel lobbies than in oil fields. Downtown Tulsa immediately took on a spiffer look when Main Street was finally paved in 1907. Looking east on Third Street in 1911. The streetcar is on the way to Owen Park. Main Street looking North in 1911. Tulsa Firsts. 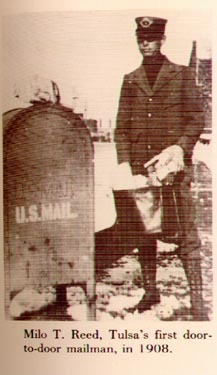 Photo of Milo T. Reed, Tulsa's first door-to-door mailman, in 1908. 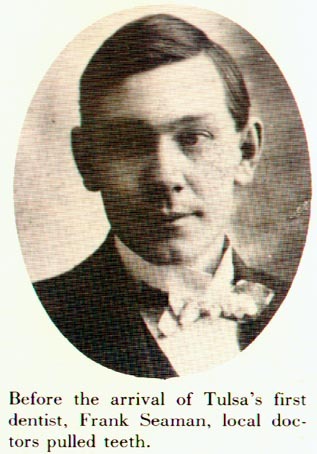 Photo of Edward Calkins, Tulsa's first mayor; elected in 1898. Dr. H.P. Newlon came to Indian Territory and opened Tulsa's first drug store on Main Street. A stalk of bananas added appeal to Tulsa's first bakery, the Bon Ton, on the west side of Main Street between First and Second streets, in the late 1890's. 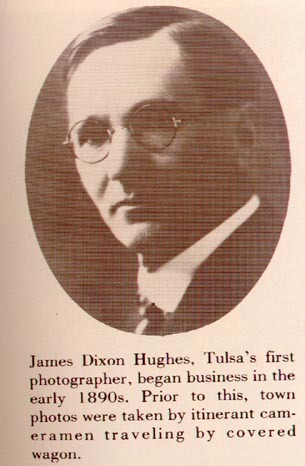 James Dixon Hughes, Tulsa's first photographer, began business in the early 1890's. Prior to this, town photos were taken by itinerant camermen traveling by covered wagons. Before the arrival of Tulsa's first dentist, Frank Seaman, local doctor pulled teeth. Troop No 1: Tulsa's first Boy Scouts. Organized in 1910.